Is the baby breastfeeding well? 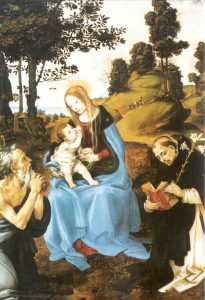 Is the baby actually getting breastmilk from the breast or is the baby just holding the breast in his mouth and making sucking motions without drinking? A baby is not getting breastmilk from the breast just because he has the breast in his mouth and makes sucking movements. Knowing how to tell whether the baby is latched on well and actually getting breastmilk makes a difference to everything that should happen next. If a jaundiced baby is not drinking well at the breast, that baby and the mother need help with breastfeeding. Supplementing of formula should be done only if helping the mother with the latch and using breast compression do not increase the intake of breastmilk by the baby. And supplementing with the mother’s own expressed milk (the first choice), properly screened donor breastmilk (every hospital with maternity and pediatrics should have a breastmilk bank), and formula (if necessary) should be done with a lactation aid at the breast. If the baby is not getting milk directly from the breast, how can the mother express milk that is “not there”? The milk is there, in almost all cases. The baby is just not receiving the milk, usually because of a poor latch. Colostrum starts being produced at about 16 or 17 weeks gestation. If the baby is not receiving milk from the breast, it is possible and desirable for the mother to express her milk (hand expression often works best) and feed it to the baby with a lactation aid at the breast, with an open cup, or with a small syringe. But the mother should be receiving help all the time to get the baby to latch on well and get the milk on his own, with breast compression often helping the baby receive more milk. 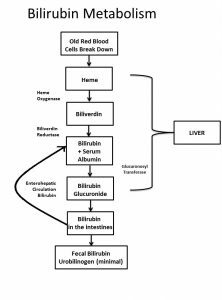 Bilirubin is formed when old red blood cells die and release their hemoglobin. The globin part of the hemoglobin is recycled leaving heme, which is toxic, and the body wants to get rid of it. So, it breaks down the heme to salvage an iron molecule from it, and forms a compound called biliverdin. The biliverdin, in its turn, is transformed by an enzyme, called biliverdin reductase (for keen students of biochemistry) into bilirubin. The usual, normal jaundice that occurs in newborns is due to the fact that the hemoglobin of the fetus and newborn is different from that of the adult and has a much shorter life span than the hemoglobin of adults (80 days on average for the fetal hemoglobin compared to 120 days on average for the adult hemoglobin), and also, to the fact that newborns have a lot of red blood cells, many more on average than an adult, and to the fact that the baby’s liver may not have the capacity to deal with all these red cells. So how does this all fit with the problem of too high bilirubin in a 3 or 4 day old baby? When a breastfed baby has a higher than average bilirubin level, it usually means that the baby is not breastfeeding well. The approach is to help the mother breastfeed the baby better so the baby gets more milk from the breast, done by improving the baby’s latch, by using breast compressions and if necessary, supplementing the baby with a lactation aid at the breast. The problem is not the bilirubin, the problem is inadequate feeding. The bilirubin is an “innocent bystander”, blamed for brain damage when it is the dehydration, acidosis and other metabolic abnormalities that are the problem in severe cases of poor breastfeeding. Phototherapy may bring down the bilirubin, but it doesn’t fix the real problem, which is that the baby is not breastfeeding well. Fix the breastfeeding before the situation deteriorates and phototherapy which may not be harmless, and supplementation would not be necessary much of the time. With regard to ABO incompatibility or other causes of incompatibility, if the baby is breastfeeding well, there is no reason for supplementation. Supplementing the breastfeeding implies that breastmilk causes jaundice. It doesn’t. In the case of hemolysis, it’s the rapid breakdown of red blood cells that is the problem, not breastmilk. If the baby is not breastfeeding well, the first thing to do is help the mother and baby with breastfeeding. It is for this reason that the so called “breastmilk jaundice” (see article),which is seen in exclusively breastfed babies up to 3 or more months after birth is not a problem as most physicians seem to believe. If the baby is breastfeeding well, drinking well at the breast (This baby is drinking very well at the breast) and gaining weight well and there are no signs of liver problems (which causes another sort of jaundice), then “breastmilk jaundice” is good, not bad, the bilirubin acting to protect the baby’s cells.